Check Rates Fab Deluxe 2 Queen "sale"
Check Rates Fab Deluxe 2 Queen Sale! Check Rates Fab Deluxe King "sale"
Check Rates Fab Deluxe King High Roller View "sale"
Check Rates Fab Deluxe King Sale! Check Rates Fab Lux 2 Queen Strip View "sale"
Check Rates Fabdeluxe 2 Queen Highrollerview "sale"
Check Rates Go Deluxe 2 Queen Save "sale"
Check Rates Go Deluxe King "sale"
Check Rates Go Deluxe King Sale! Check Rates Go Luxury King Strip View Sale! Check Rates Go Luxury King Stripview "sale"
Check Rates Godeluxe 2 Queen Highrollerview "sale"
Check Rates Godeluxeking Highrollerview "sale"
Check Rates Goluxury 2 Queen Stripview "sale"
Received the room I asked for do I ask for front desk staff was most accommodating I believe I was in one of the go room overlooking the seasons redone remodel full size bathroom first time back in five years staying at the Flamingo because it was in such terrible shape yes the elevators now work that's an inside joke highly recommended Flamingo convenient upgraded and fun. 06-Apr-2019 Verified Review, stayed from Sun Mar 31 to Tue Apr 02 2019 at a $60.10 average nightly rate. "Great location in the middle of the strip!" The Flamingo has maintained it's integrity from my last visit to Las Vegas 13 years ago. Our room exceeded our expectations for the very low week day rates during March. Everything was very clean, staff was courteous and friendly, food was excellent, plentiful and reasonably priced. I have only one criticism and that is the continual aggressive approach from "Casino hosts" at Flamingo (and most of the other casinos we visited). It got annoying, to say the least. But had a great four days and hope to return soon! Natalie Solop. 02-Apr-2019 Verified Review, stayed from Tue Mar 26 to Fri Mar 29 2019 at a $43.80 average nightly rate. Great Service. Room was great, front desk was so friendly. Overall experience was great. 07-Mar-2019 Verified Review, stayed from Wed Mar 06 to Thu Mar 07 2019 at a C$33.30 average nightly rate. Great, had a very good experience. Thank you. 27-Dec-2018 Verified Review, stayed from Mon Dec 24 to Fri Dec 28 2018 at a $35.12 average nightly rate. Complimentary 24 hour parking with valid Nevada license. Complimentary valet & self-parking for Platinum, Diamond, Seven Star members. 1 to 4 hour self-parking $5. 4 to 24 hour self-parking $8. Up to 4 hour valet $8. 4 to 24 hour valet parking $13. 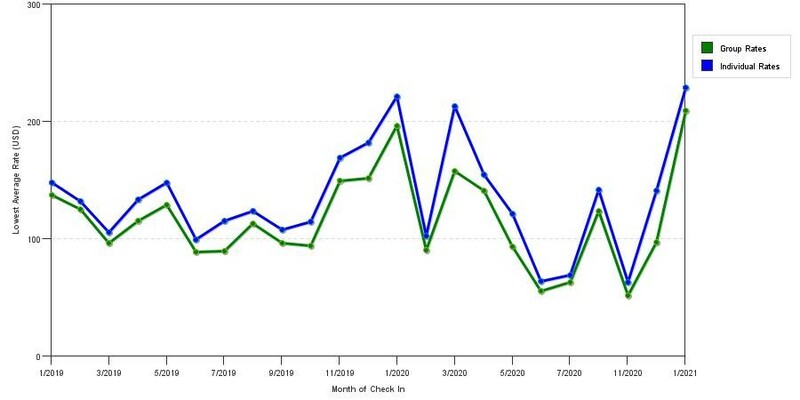 The chart above shows averages of prices for both group/meeting rates and the best individual traveler rates our rate checker could find at the time the group/meeting offer was placed. The most competitive group rate shown is 21.8% in September 2017 and the highest average individual rate is $368 in the month of January 2020. This chart will show past seasonality and also project future months. 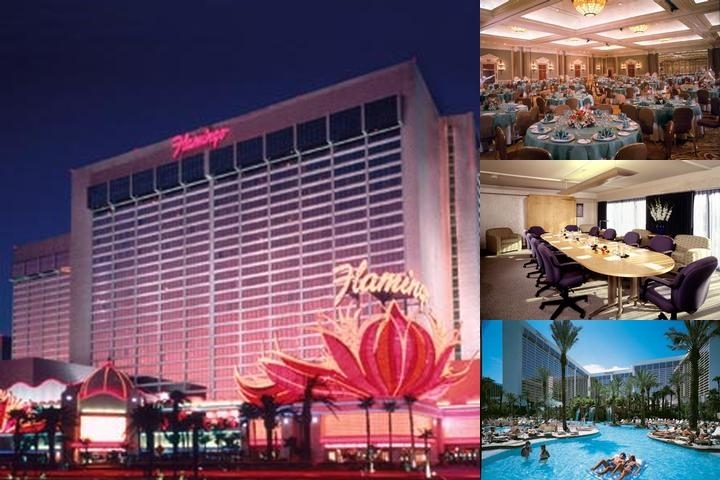 If you are flexible with dates, you may want to consider staying at Flamingo Las Vegas in a month when rates are lower.